Libya is ranked 94 out of 188 countries on the Gender Inequality Index, with only 30 percent of Libya’s women participating in the labor force compared to 76 percent of men, despite women receiving more education on average. 2014 indicators—produced by UNICEF, WHO and the World Bank—show that 21 percent of children under age five are stunted, a figure that has remained level for 20 years. Libya is seeing shortages in food, fuel, water, electricity and cash as a result of ongoing conflict in civilian areas throughout the country. According to the World Bank, armed conflict has cut income per capita in half over the last two years. The conflict has impacted both food security and livelihoods because of reduced purchasing power, decreases in overall food availability and increases in price. Internally displaced people are among the most vulnerable populations in Libya. Social welfare systems and community networks have eroded since fighting intensified in July 2014. Due to conflict and political instability, WFP and the rest of the UN have been operating remotely from Tunisia since 2014. Through its Emergency Operation, WFP aims to provide food assistance to people who are food-insecure as a result of the conflict. WFP began 2016 by planning to reach 70,000 people in January, and aims to scale up to reach 210,000 people each month during the final quarter of 2016. However, due to periodic funding shortfalls, WFP has been unable to reach these goals. 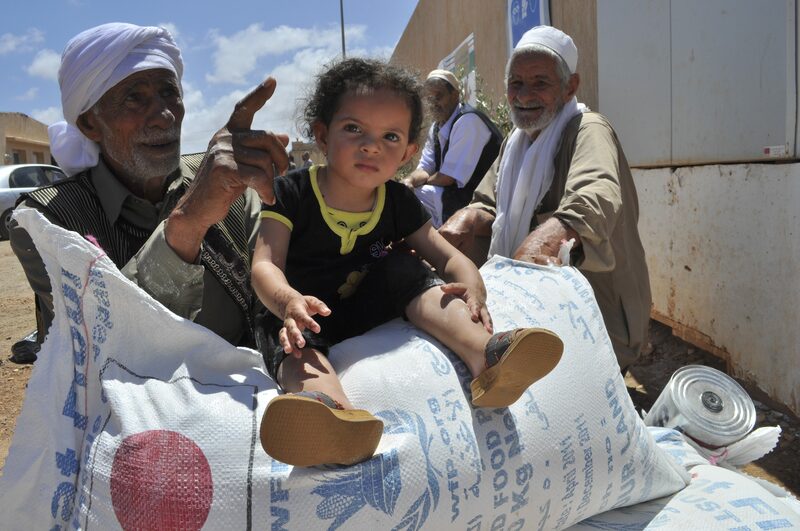 WFP operates primarily through two local cooperating partners—LibAid and STACO—delivering and distributing food assistance throughout Libya. Each family receives two food parcels—enough to feed five people for one month—consisting of rice, pasta, wheat flour, chickpeas, vegetable oil, sugar and tomato paste. These food rations provide 75 percent of daily energy requirements per person per day, as internally displaced families often have access to some additional sources of food. WFP works with local and international NGOs and consulting firms to help provide information that will identify and target the most vulnerable households.